Wool applique is climbing in popularity in the crafting world. Once you you've completed Paula's Introductory class you can join the monthly club and applique various projects. Wool applique is an easy, relaxing, and portable craft. 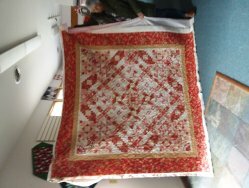 Our instructor's introduction to wool applique, penny rugs, hand dyeing and felting wool will get you started in this form of quilting. You will be provided a kit for $10 for the class, and will learn about the needle choices, basic and decorative stitches.